LMS evaluations are typically painful ordeals for not just committee members but also for the vendors. They have to provide multiple demos, have lots of Q&A, and write 100+ page proposals based on extensive feature requirements and perhaps even more painful terms and conditions. But there is one case that might be worse - not even getting to compete when your product appears to be an excellent fit. And that is the situation that Schoology finds it in for the majority of higher ed evaluations. Schoology's original market was aimed US-based K-12 institutions, and for paying school or district LMS selections Schoology is probably one of the two strongest competitors, along with Canvas. Schoology does have an international presence and over the past year and a half have targeted an expansion into higher ed. Michael wrote a post after the company raised $32 million in new funding last fall, largely to fund this expansion. I described the institution-wide adoption by Wheaton College in Spring 2016, following the Colorado State University Global Campus adoption in early 2015. But what I don't see is a real acceleration in the higher ed market yet. There are a few significant LMS active evaluations that include Schoology, but the majority of higher ed LMS evaluations over the past two years have not treated Schoology as a real competitor. Based on what I've seen, this lack of evaluation is not based on the product itself. Schoology is one of the new generation of learning platforms designed natively for the cloud (on Amazon Web Services, where else?) and designed with an intuitive interface both on web and mobile. From a product perspective, it is hard to find significant deficiencies as the depth of features is comparable to Blackboard, D2L and Moodle, yet the system has avoided succumbing to feature bloat. There are cases where the market terminology of K-12 embedded in the product interface needs to be altered to not confuse higher ed institutions, but this is different than having missing features or features that miss the mark. The most notable design that is unique to the Schoology is the Facebook-style "Recent Activity Feed". This feature can be applied at a course level, group level, or for an individual (therefore across courses and groups). Faculty members and course designers have the option of setting Updates (think of these are mini announcements with comments) as the default view for a course instead of Materials, which gives a more traditional LMS view. The result is a feed in the center column (primary viewing space of the platform, labeled as '2' from this support post). This feature is significant, and it is different than other LMS activity feeds that tend to list recent content and activity types (list of announcements, as can be seen with Canvas and Blackboard's Learn Ultra). Note that there is a quick entry for Updates, Assignments and Events - this allows faculty to use the system largely based on the feed if desired. What I've heard from quite a few K-12 teachers (at the Schoology NEXT users conference and at ISTE) as well as higher ed instructors is a general view of "I don't need training to use the system, it's just like using Facebook." Students also experience the system differently through this feature. Several of the customers I've talked to this summer have emphasized the greater natural usage of the LMS by teachers and faculty after adopting Schoology. Beyond the activity feed, there is fairly robust functionality for Mastery-based pedagogies such as competency-based education (CBE). 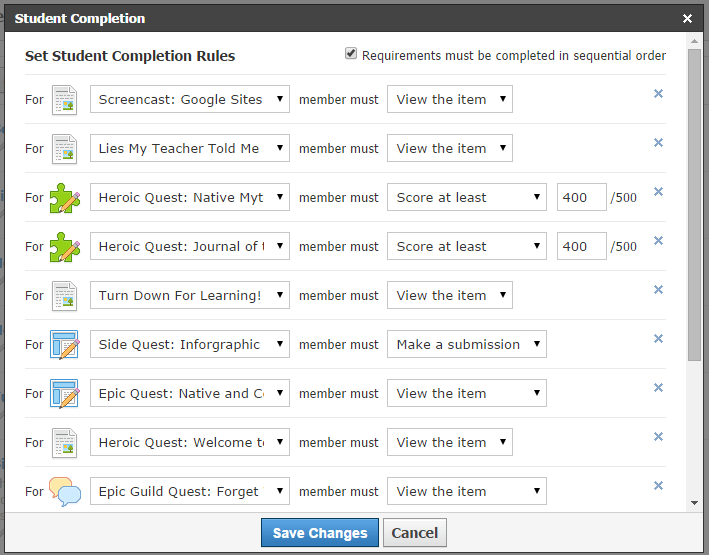 Instructors and course designers can choose from a number of options of student completion rules to create a pathway. At ISTE and the Schoology users conference, the company announced a new Assessment Management Platform (AMP) aimed at development of assessment authoring, common test banks, and outcomes reporting at a level beyond the course - for departments, programs, or institutions. The press release and demonstrations to date have been focused on K-12 usage, but I believe there will be a secondary 'release' prior to EDUCAUSE for the higher ed market. From the users conference, CEO and co-founder Jeremy Friedman described how AMP is positioned. "AMP is starting to the pave the way towards personalization," Jeremy explained. "How it's doing that is it allows you to create assessments outside the context of a course. And so what you'll be able to do is build an assessment outside the context of a course. You'll be able to push it into multiple courses. You'll be able to make an update once and have that update push everywhere. And you'll be able to roll up all that information. You'll be able to see mastery and numerical results across courses, across an institution. You'll be able to enact change." For the few colleges and universities that have fully evaluated Schoology at the same level as Canvas, Blackboard, D2L, Moodle or Sakai, there a sense of surprise at how well the product matches higher ed needs and how rich is the feature set. So why hasn't Schoology made a stronger presence in higher ed yet, and will this change in the near future? While no one fully knows the answer to those questions, there are a few theories worth considering. The most obvious one is the historical one-way valve between edtech in higher ed and K-12 markets. There are plenty of examples of tech moving from higher ed to K-12 but very few in reverse. For LMS, Canvas started out mostly in higher ed, but at this point they have more K-12 customers than higher ed and soon might have similar revenue between the markets (K-12 institutions typically pay roughly half as much per student for an LMS as would a college or university). D2L and Blackboard have long had K-12 clients, and recently D2L's biggest client wins have been in K-12 (the state of New Mexico and Florida Virtual School in particular). The perception is that edtech developed for colleges and universities can work in K-12 as long as there are methods to reduce clutter and make the interface much simpler for both K-12 teachers and students. Schoology, however, is attempting to go the opposite direction. From what I've seen and heard, the challenge is not the product itself as much as the perception of K-12 systems. R1 universities have enough trouble accepting technology that is used in community colleges, and getting them to think of K-12 technology is much more difficult. Schoology's market presence, including press releases and web site content, reinforces the perception that this is a K-12 system. Schoology's success in K-12 is working against them in higher ed. At the same time, there is a question about the market's appetite for another native-cloud highly-usable LMS in higher ed. In terms of mindshare, Canvas has that category locked up right now. While a second competitor makes sense from a general market perspective (more companies delivering what schools seem to want), it might not make as much sense in higher ed where there has been a historical tendency to accept a very small number of vendors. Institutions do not have a clear sense of why they should consider both Canvas and Schoology as options, at least until they dig deeper. Typically edtech solutions get over this type of barrier once they have strong reference accounts. For Canvas, the selection by the Utah Education Network got people's attention, but the Brown University selection signaled that it was safe to evaluate the new LMS back in 2011. For Schoology, they have clients that are outliers - a somewhat unique online arm of Colorado State U, several Christian colleges, and two isolated community colleges - but do not yet have more mainstream references. Beyond the pack mentality aspect of this tendency to wait for other schools to jump first, there is the risk factor to consider. Because Schoology does not have many higher ed clients, at least at the institutional level, we don't fully know how well the company works with universities. Early schools looking at Schoology will have to take some risk and will need some deep-dive evaluations on their own. At the NEXT conference, there was one other issue raised during the opening keynote - company maturity. While the product seems quite mature, I believe the company is aware that they need to improve their organizational capabilities to address the market barriers described above. There are other LMSs out there with limited adoption at the institution level for higher ed, but Schoology is the one that seems most likely to have a real impact on the market. If they can figure out how to overcome the market barriers in expanding from K-12 into a higher ed market that tends to favor a small number of competitors. Schoology needs mindshare if they are to succeed in higher ed, and this challenge requires much more than strength of their product offering. We'll keep watching and updating on e-Literate.